When it comes to medical device repair, the lowest price is not the path to long-term savings. In fact, there is often a high cost for the lowest price that takes years to overcome. Real, sustainable savings in the complex imaging device industry come from carefully concerted strategies that don’t emphasize price. Success depends on strategic inventory management and maintenance, and in-depth knowledge of lifecycles, historical failure timelines associated with specific makes and models of probes, coils and radiography systems. Following are three critical components for inventory management and ROI that are proven to produce long-term savings, increased access and greater efficiencies. Ben Franklin’s famous quote, “An ounce of prevention is worth a pound of cure” really hits home for managing imaging devices. Our Centers of Excellence have built preventative maintenance programs proven to extend the life of probes and coils which helps cure the high cost of ownership. Getting just six more months of use from one device can free up thousands of dollars in operational costs. When preventative programs are built upon research, testing and other activities that go into evidence-based repairs, they have a much higher propensity to extend the life of a device and prevent potential failures. Engineers at our Design and Manufacturing Center of Excellence build preventative protocols around our vast data of knowledge from proprietary testing and our more than 150,000 successful probe repairs and 25 years of manufacturing and repairing MRI coils that are proven to minimize failures and extend performance as originally intended by the OEM. For most makes and models, our data can help us determine a general time frame that specific parts may diminish in their performance, lifecycle expectations, and recommend maintenance schedules accordingly. For example, replacement of a bending rubber on a TEE probe as preventative maintenance will prevent a larger, much more expensive failure downstream. A savings strategy that drives profitability by lowering costs involves a holistic approach to inventory management. Successful inventory management is not just about price points and first-in/first-out (FIFO) rotations of new and old equipment, it is about finding ways to make each device last longer to postpone major purchases and free up capital budgets. Having information either via your own observations or testing and benchmarking input from repair partners can help predict when given models are likely to start to diminish in performance. This knowledge helps avoid downtime from failures or compromised performance. Consultative, knowledge sharing from industry leaders can have a big impact. Partners with the greatest ability to help you save money are those with the most knowledge about when and how specific probe, coil and radiography device models start to diminish in performance. Partners that continue to test and expand their knowledge base can provide insights, maintenance schedules and, very importantly, training on inventory management and maintenance strategies that maximize uptime and ROI. 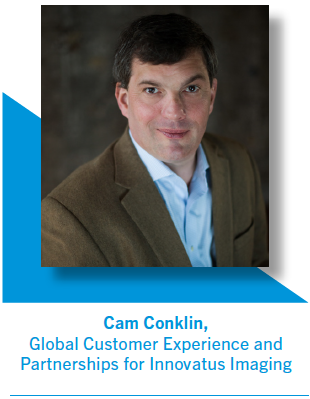 Cam Conklin is responsible for Global Customer Experience and Partnerships for Innovatus Imaging and has more than 20 years leading savings and inventory management strategies for imaging devices. He has been with the Innovatus Imaging team since 1998.